This blog post was first published on September 11 2011, and substantially revised and updated on September 18 2015. On Saturday September 17, Australia celebrates Australian Citizenship Day. The date was chosen because September 17 was the day that the Nationality and Citizenship Act 1948 was renamed, in 1973, The Australian Citizenship Act 1948. We have been celebrating Australian Citizenship Day since 2001, and it is organised by the Department of Immigration and Citizenship. Australian Citizenship Day is one to think about what unites as Australians, to take pride in our national citizenship, and to celebrate our democratic values and commitment to a fair go, equality, and respect for each other. 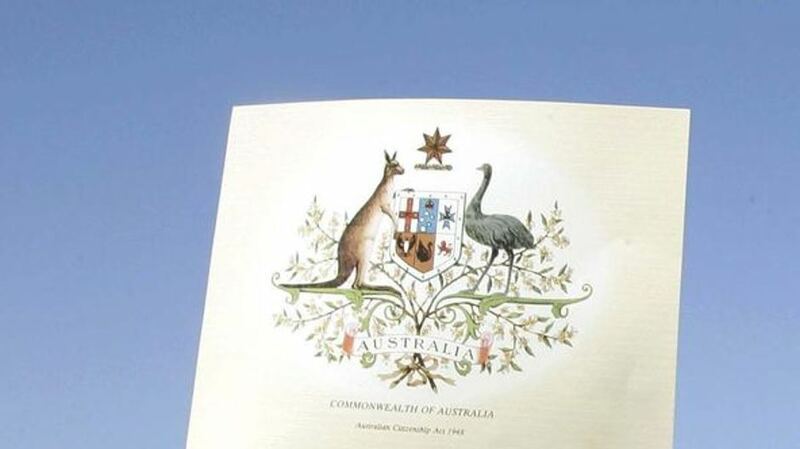 Local councils are encouraged to hold citizenship ceremonies and affirmation ceremonies, where you affirm your loyalty to Australia, just it case it had started waning in the interim. Citizenship Day is one to remember that we are all Australian citizens, whether you were born here 80 years ago, or just took out citizenship. It seems like a great opportunity to look at a name that has only recently come to Australia from another land, and although many names have been welcomed to our shores, this one stood out as a success. Cruz is a common Spanish surname which means “cross”, coming from the Latin word crucis; it originated in Castile. Many places throughout Europe got their name from a prominent cross used as a marker; perhaps for a public meeting place or a market. This is the origin of the surname, and as there are people called Cruz in Spain, there are Crosses in Britain, Groses in France, Kreuzes in Germany, and so on. In the Christian era, the name took on religious significance, and in some cases the surname Cruz might have been bestowed on someone who carried a crucifix at festivals. Cruz has been used as a personal name in Spain since the Middle Ages. You can often find it in name combinations such as Santa Cruz (“holy cross”) or Vera Cruz (“true cross”), to underline its Christian significance. In early records, it seems to have been commonly given to babies born during the Lenten and Easter seasons. The other key date for the name is around mid-September – The Feast of the Holy Cross is on September 14. The name was originally given mostly, but not exclusively, to girls. However overall the name has been given fairly evenly to both sexes in Spain, but with females still ahead. In Latin America, records show it as unisex, but with males slightly ahead of females. The name isn’t popular in Spanish-speaking countries, and is often seen as rather dated for either gender. The United States is the only English-speaking country where Cruz has much of a history, thanks to its significant Hispanic population. It has been on and off the US Top 1000 since records began in 1880, and has been continually on the charts for boys since 1980. It charted as a girl’s name a few times in the years leading up to World War II. Currently Cruz is #290 in the US, and fairly stable. In the UK, the name Cruz gained publicity after English football star David Beckham chose it for his third son. Although it is presumed the Beckhams chose a Spanish name to honour David Beckham’s football team at the time, Real Madrid, and perhaps as a nod toward the tattoo of a cross David got in 2004, (apparently for vaguely religious reasons), Cruz seems much more of an “American-style” name, like his siblings Brooklyn and Harper, than one used in Spain. The name began charting in the UK after Cruz Beckham’s birth in 2005, and it is currently #381 and rising. In Australia, Cruz is a celebrity baby name as well, as tennis champion Lleyton Hewitt, and his wife, actress Bec Cartwright, called their son Cruz in 2008. It seems to be a name which appeals to male sportsmen, because there are several other Australian athletes with sons named Cruz. Cruz shows up a few times in Australian historical records, always on people of Hispanic heritage, and often from countries such as the Philippines or islands such as Guam. In 2012, the name Cruz was #115 in Victoria, and would have been in the Top 100 if combined with the spelling Cruze. Apart from the obvious star-factor of the name Cruz, I think it’s doing well in Australia because it’s short, simple, sounds very boyish to our ears, and the z-ending seems to give it a little pizzazz. It’s almost a “car” name in Australia, as we have the Holden Cruze, so this connection with sports and cars probably makes it seem blokey. Perhaps it also reminds parents of the slang words cruise and cruisey, which seem to sum up our relaxed attitude and way of life. If anyone looks up the meaning and sees that it means “cross”, it will of remind them of our own Southern Cross, twinkling down at us from the night sky, and appearing on our national flag. In other words, it seems like a name well suited to Australian conditions, and is almost verging on the patriotic. Cruz had been inducted as a citizen of Australia, affirmed his loyalties to our way of life, and proudly hung his certificate on the wall. Welcome to Australia, mate. Cruz received an approval rating of 58%. 29% of people disliked it, while only 9% loved it. If Cruz for boys why not Zoe for girls? I’m not sure I really understand … Zoe is already a girl’s name? There was a question of Million Pound Drop on Saturday night here in the UK about the popularity of the names of the Beckham kids, asking which one was most popular. Whilst it actually goes in age descending order, the tweets from people playing along online suggested most believed either Romeo or Cruz to be the most popular name in England&Wales out of the four, not Brooklyn. Is that because in the UK, as here, there are many variant spellings of Cruz, so that one receives a general impression of Cruz being a rather common name? (I did search your site to see if you’d covered the popularity of Cruz, but no luck).